The ring has long been the shape of wearable dreams. Logbar tried it as an all-in-one device that would be the gesture-controlling center of your digital world; Nimb used it as a subtle panic alert device; Ringly has mastered the sleek form-meets-function subtleties of a good wearable. Now along comes Token, with a pre-sale launching today for its biometric-based wearable ring that can make payments, power up a computer and part doors — all with a wave of one magic finger. The company’s first eponymous product is a chunky looking ring that’s integrated with MasterCard, Microsoft, Visa, HID, FitPay and the FIDO Alliance. Token’s ring uses a combination of fingerprinting (there’s a fingerprint sensor at the base of the ring) and an optical proximity sensor to ensure that a user’s credentials can’t be accessed by a third party. Using an app (available for iOS and Android), Tokenites can pair the ring and their biometric information with anything from their credit cards to their car keys. “​The way we prove who we are is broken. Token allows you to prove who you are — from your front door to your office to the grocery store — while simultaneously protecting your information with advanced cryptography,” said Token co-founder and CEO Melanie Shapiro in a statement​. This is Melanie Shapiro’s second foray into tokenization, identity and payments. Alongside her husband (and Token co-founder) Steve Shapiro, Melanie had launched Case, a bitcoin wallet that was designed to protect the cryptocurrency in the age of Mt. Gox. The Rochester, NY-based company managed to secure $1.5 million from Future\Perfect Ventures, RRE Ventures, High Line Venture Partners and the Rochester Institute of Technology Fund. Indeed, its fingerprint sensor, a camera and built-in GSM chip case laid the seeds for Token to take shape. And though the Shapiros are abandoning Case for the new Token business, they haven’t forgotten about the initial customers who bought their first product. According to Shapiro, customers who bought the Case bitcoin wallet will still have the product support they need even as the Token goes on sale next week. The sterling silver Token ring only works when it’s worn by a user, who verifies their identity with a fingerprint scan in the morning and then with a series of gestures throughout the day. Any time the ring is removed, Token’s proximity sensors lock credentials and will only reactivate them when the fingerprint of the original user is detected, the company said. The company’s claim is that the ring is a more functional and frictionless solution to verifying one’s identity than remembering the host of passwords that are required to mediate daily life. The ring pairs with most credit cards, its own electronic lock, many car ignition systems, passwords, transit cards and even corporate access cards, according to a statement. On its own the ring costs $249. Paired with the Token locking system the package is $349, which is the same as pairing Token with the ignition unlocking mechanism. A package including the lock and the ignition detection hardware sells for $399. The ring is available in three finishes, with the black and rose gold finish tacking an additional $50 onto the retail price of the ring. 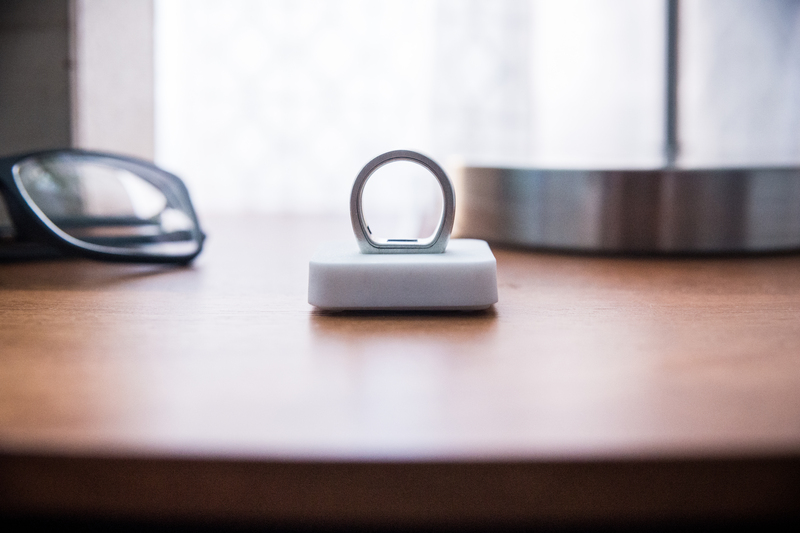 Every ring has a battery that should last for two weeks before recharging; an inductive charger is included with the purchase. The rings are also waterproof up to 50 meters. Credentials are stored on an EAL5+ secure element and all rings are compatible with Bluetooth and NFC.